Stop into Baker Pool & Spa today! Our team is always ready to help with any questions you may have concerning our products, services, and accessories! Located conveniently in Chesterfield, we provide swimming pool and hot tub remedies to a variety of St. Louis surrounding cities, including St. Charles, St. Peters, O’Fallon, Wentzville, Fenton, Union, Pacific, Washington, and many more! For additional information concerning our offerings, please feel free to contact us. In the early 1960s Tom Baker was in the farm supply business. In particular, Tom constructed grain silos and sold milk-extraction equipment. The grain silos were make of radius steel panels bolted together and anchored by a concrete footing. One day Tom and one of his customers were staring at the first rung of what would soon be an entire grain silo. The farmer said to Tom, “If you were to put a liner in that base as it is, it sure would make a good swimming pool.” Tom Baker, the entrepreneur that he was, listened to that advice and the rest, as they say, is history. Baker Pool & Supply, Inc. was born in 1968 and almost from it’s inception was the premier builder of swimming pools in the St. Louis area. Over the years a custom designed inground swimming pool niche was forged and even to this day we enjoy a strong presence in this market. As a direct off-shoot of building quality inground swimming pools, a service department and retail store was established in the mid 70s. The primary focus of these departments was to cater to the service and supply needs of the ever-growing list of new in-ground pool customers. 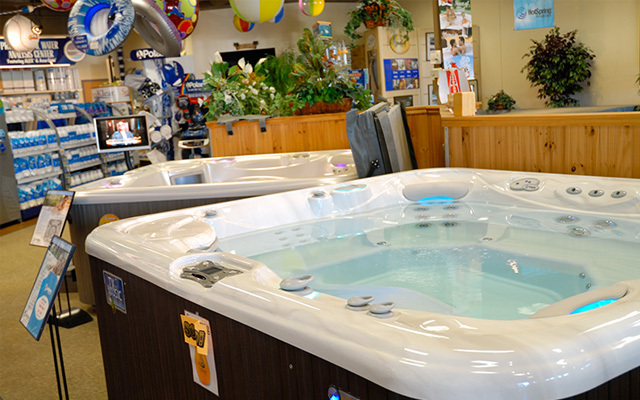 Over the years, however, the retail store, primarily with the introduction of portable spas, has become a self-sufficient department that rivals in-ground pool construction for total revenue. The service department has also developed into a self-sufficient department, although its primary focus caters to the needs of our in-ground pool customers and portable spa customers.